Emergency lighting is an essential service that is quite often forgotten until an accident or catastrophe happens. In the past it has been fires, today the threats can be far more sinister and this highlights the need for emergency lighting maintenance and evacuation procedures to be regularly conducted. In New York’s World Trade Centre Towers the occupants had minutes, not hours to escape and most escaped in darkness. Emergency lighting provides the illumination that enables people to see clearly, to avoid obstacles and to be able to move faster and more confidently to the nearest exit and to safety in a crisis. A forced evacuation from a building, even one that is familiar with is not easy, that is why evacuation procedures are mandatory in workplaces. Should a sudden crisis occur, the occupants of a building will travel much faster down adequately illuminated pathways with well illuminated emergency signage. It is therefore imperative that the emergency signage is easily understood. The emergency exit luminaire has now changed to the international standard of pictograms. This new international standard displays an arrow pointing the way and a man hurrying to the nearest egress point. This is a truly universal sign that is to be adopted worldwide. It is a requirement that emergency luminaires are positioned correctly to ensure adequate lighting is always available in an emergency. The emergency luminaires must be installed on a lighting circuit and derive its supply from a permanent active. 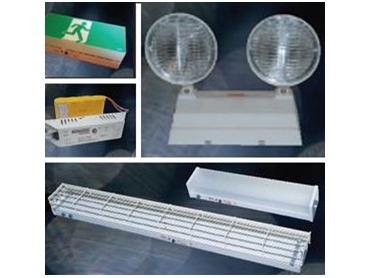 As emergency lighting is an essential service and periodical maintenance is a requirement. M&H Power Systems developed the Bardic Sentinel Self Testing Unit to provide a cost effective way to ensure that the required tests are routinely performed to meet or exceed the requirements of the Australian Standard AS2293 and the Building Codes of Australia’s requirements. The testing procedure is performed automatically every three months and at the completion of the test, a report is generated by a series of signals from a dedicated Yellow LED located on the side of the emergency luminaire. These performance tests do not disrupt the occupants of the facility or the fabric of the building as it is a seamless operation. It also ensures that the emergency lighting function correctly in a sudden crisis by illuminating the area around the luminaire. The performance tests can also be performed manually, at any time, by just pressing the Test Switch located on the emergency luminaire twice within a three-second period. The Self Testing Unit tests the luminaire automatically by simulating a mains power failure. The test procedure disconnects the mains supply through an onboard relay so that the emergency luminaire is illuminated and powered from its own inbuilt battery source. Whilst the emergency luminaire is illuminated and the automatic Self-test is in process the inbuilt battery is slowly discharged. Once the test is completed, the mains supply is restored and the battery is trickled charged to full capacity. The cyclic effect of a slow discharge and then a trickled recharge increases the life of the batteries and the performance of the emergency luminaire. To comply with the requirements of the Australian Standard AS2293 the emergency luminaire must provide the correct illumination for a period of at least 120 minutes on initial installation and ninety minutes thereafter. Once the emergency luminaires Self Test are completed, the results recorded into the buildings emergency lighting Log-Book, then the emergency lighting is deemed in compliance with the Australian Standard AS2293. As it is never known when the emergency lighting may be called upon. The Self Testing of emergency luminaires automatically together with periodic maintenance procedures virtually guarantees that should a sudden crisis occur that the emergency luminaires will function correctly and switch on to illuminate the area to allow easy egress of the building. The illumination from theses emergency luminaires enables people to see clearly, move faster and more confidently to the nearest exit and to safety.